I just have a few quick announcements for you all this fine weekend, before I go to get my beauty sleep in preparation for another week of hard work and great progress. It’s now official: if you don’t want to drive all the way out West to pick up your bread orders, you can order for pickup at Cruzan Gardens (mid island) on Wednesdays! Please specify your pickup location in your order, and be sure to swing by between 4 and 5pm at Cruzan Gardens, or 3:30-6pm at the VI Locally Grown table in F’sted. Baking for pickup at Little La Grange will continue on the 2nd and 4th Saturday of each month, as weather permits. At Cruzan Gardens you’ll also find carambolas, passionfruit, fresh flowers, and okra all grown by Cynthia, along with avocados and all my packaged goods including toasties, croutons, cookies, granola, and chutneys. Open Tue-Fri 9-5, and Sat 9-1. Excuse my poor photography, and look instead at that gorgeous texture; open, chewy; simply mouthwatering. 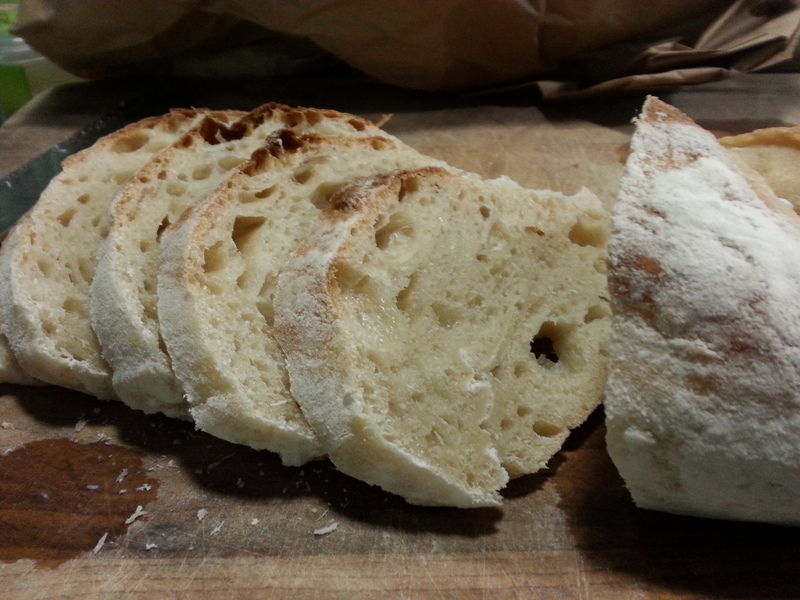 Nidulari white sourdough bread. 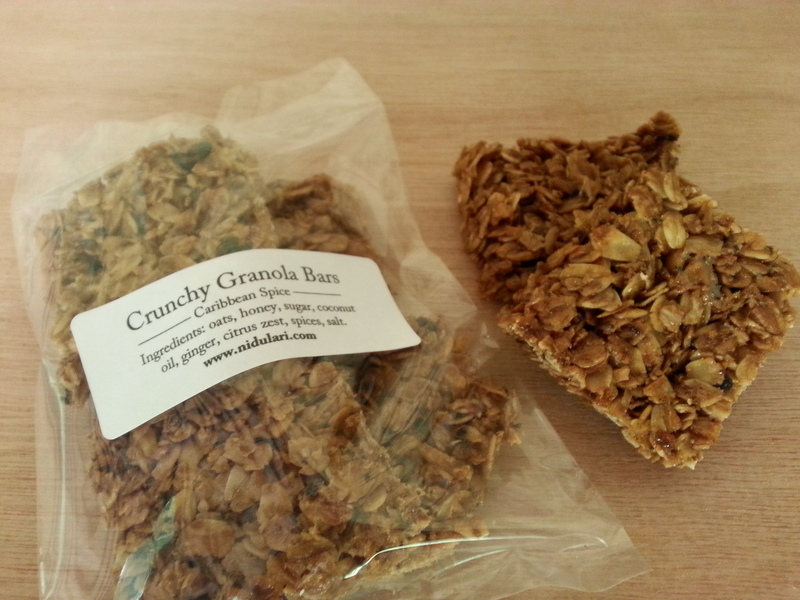 Also, check out our newest product, delicious Granola Bars! Made with oats, honey, and spices, they make for the perfect snack, to-go breakfast, or even dessert. Today we welcome our newest WWOOF volunteer, Hannah, who has traveled far to spend a while helping with the projects here. Well, we know that really she’s just escaping winter…but that’s ok! 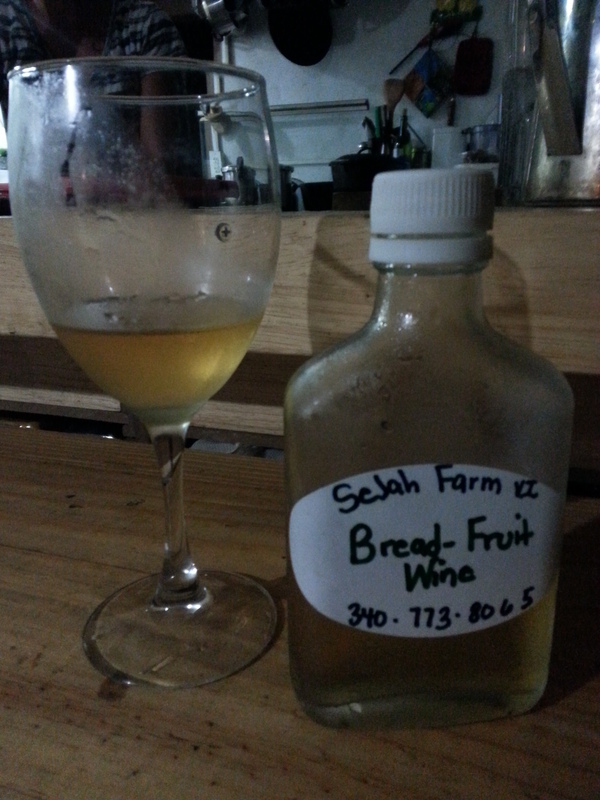 I toast with tasty breadfruit wine, made locally by Sejah Farm! Soon I hope to be drinking my own, home-brewed wine…just a couple more months. Til next week, and here’s to seeing some of you at Cruzan Gardens this Wednesday afternoon! So good to see you are just moving along with the Nid it is really looking like a home especially the one you have been waiting for andxworking so hard to build. I have missed seeing you and having your delicious goodies but it is a bit far for us so glad you will be mid island. I will have to find out where Cruzan gardens is I think it’s on the toad to go to Sejah farms. Do we need to order for Cruzan Gardens on the website or just email you what we want. Hope Hannah works out for you she is a woman so she should be good!!!! Have a great week and see u Wednesday. Hi Diana, you can order through the order form as per usual! See you soon!